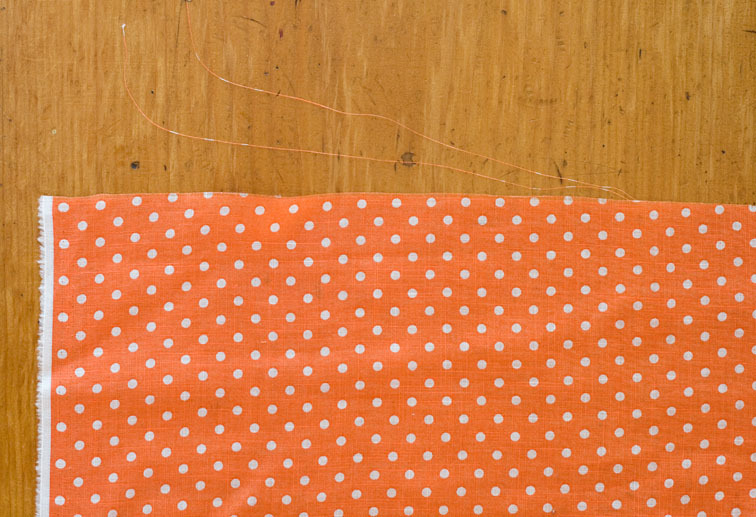 I’m sewing with this charming spot fabric in the fabulous shade of, ahem, Tangerine Tango this week. It is a printed cotton voile from Global Fabrics*, and I thought it was an ideal opportunity to demonstrate another thingamajig. Now look at the print – see how the dots are not aligned with the grain? This can be a real problem with prints! For a small all-over spot like this one, the off-grain print is not going to be very noticeable in the finished garment, so I am going to ignore it. It would be nice if the spots were straight at the hem, but that is only going to happen if it is cut off-grain. Larger geometric designs that are printed off-grain could create a real issue as it may be noticeable in the finished garment. Just another thing to watch out for when selecting your fabric! Thank you for highlighting this, Sherry. I need all the tips I can get! I have a grain line question. I was trying to lay out some fabric a few months ago and could not get the grain line straight. I could get the cut edge straight and lined up but when I did that the selvage edges were not together. I wasn't sure what to do and ended up not using the fabric. I wonder if Kathi G was trying to straighten a twill weave. I can't figure out how to straighten twill, plus I have read that even if twill is straightened by forcing the crosswise and lengthwise grains into a 90 degree angle, it is a bad idea because the fabric will revert to how it came off the loom, with the prevailing tension pulling it off grain. Can you advise? I had this problem when I made my last polka dot blouse. I only noticed it when I tried to straighten up the hemline. Love the colour of the polka dot fabric Sherry and looking forward to seeing the finished garment. sometimes the fabric gets stretched out of square if it's wrapped on the bolt too tight. I've had trouble with this and I'm not really sure how to deal with it. I'd wash it and hope that helps. It's so exciting, because there's generally crappy fabric here, and super expensive fabric, and quilting fabrics.. But not really anything that's good quality and medium prices. YAY! Do you go with grainline or pattern when you have an off-grain stripe? I am popping through Akl in March and would love to check out a fabric shop while I'm there, would Global Fabrics be the one you would recommend?? 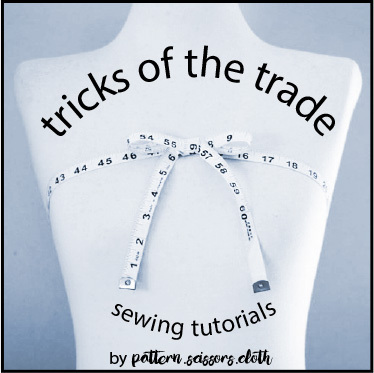 You could try squaring the grains by brute force – pull the fabric in a bias direction and steam press. If the fabric is severely off grain you may not win the battle, in which case line up the selvedges and follow the more dominant lengthwise grain. The nature of a twill weave produces a diagonal line effect, this diagonal line is not the lengthwise grain. The lengthwise grain is always parallel to the selvedge, sometimes it is easier to detect from the wrong side. I went yesterday, gulp…and it is all hiding in amongst some older fabrics…becoming old stash very fast! Luckily stripes are usually woven or knit, probably for this reason. If I wanted to bind an edge with my spot, I would quite happily cut it off-grain to have a neat row of dots! It helps that the lengthwise print usually correlates to the lengthwise grain, so button stands etc look OK. 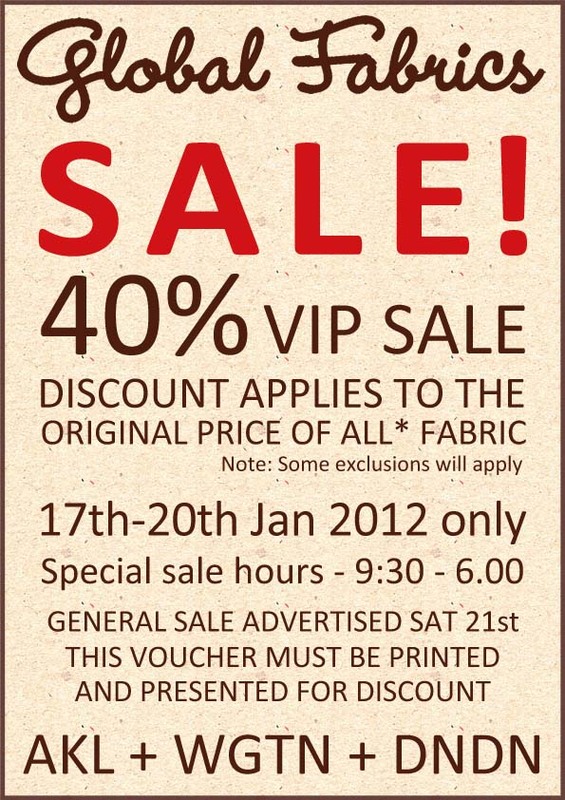 I am not aware of any others as I'm quite new to buying fabric retail, but maybe someone else can chip in! Oh, how I remember the days of junior high school home economics, when Miss Brooks made us ravel a thread all the way across the fabric to find the straight of grain. We had to measure the edges of our pattern pieces to determine a consistent distance from the selvedge (why? why? why?) as we lined everything up with military precision when laying out for cutting. Made little sense if one's fabric was printed off-grain, but that's the way it was in her little kingdom. Dear Lord, please don't make me be 13 years old ever again, amen. Your pattern class sounds like it could be a great learning experience – now all I need is some RTW clothes to copy (haven't bought clothes for years but always hanker for the perfect fit jeans, as yet elusive). Did you buy anything from the Global Sale? I have resisted thus far – burgeoning stash, overwhelming me. I am totally in the category she talks about – someone with a lot of sewing behind me, but a hobbyist, who is looking to improve but is not wanting to turn it into a profession or do years of training! I think Global Fabrics is great for merino, and some nice silks and prints. Centrepoint fabrics has a large selection, but is quite expensive. I go to Dress Smart in Mount Albert a lot, you need to dig through what they have, but the prices are great. I will give it all I've got next time I try to use that off grain fabric again. Thanks for the link, it is so interesting to read the comments. I'd love to write a book one day! I have a printed polka dot cotton, the dots are around 7/8″ wide, and as you mention above the pattern is off grain, by around 1″ I think. If I cut out the dress pieces so that the polka dots all line up, will the dress hang strange because it has been cut off grain? So would it then be best to cut on the grain to get the hang, and individually lay each pattern piece onto the right side of the fabric, one piece at a time, to match the polka dots as best I can, to get the right match? I have The Colette Sewing Handbook, but it doesnt really mention what to do with off grain fabric. I have 3 meters in a lovely mustard colour, so would hate to not use it.